The rehabilitation benefits of hydrotherapy have been widely accepted throughout history, starting with the roman baths and spas. The warm water used in our Hydro-Physio suite helps promote blood circulation, whilst helping to relax recuperating muscles. The introduction of a motorised treadmill allows the patient to exercise in a supported and controlled environment. We offer a comprehensive rehabilitation programme, tailored to each individuals requirements. The idea behind hydrotherapy is to allow maximum muscle contraction with minimum weight bearing on joints and bones. In this way we can introduce therapeutic exercise post surgery much quicker than if land based only. This buoyancy allows ambulation when weight bearing would be contra-indicated and helps stabilise the body in a vertical position. The temperature of the water also has thermal benefits – warm water assists with pain relief, whilst cooler water reduces inflammation. These cases are very rewarding to treat, as huge improvements are often seen. Clients have reported a return to puppyhood and a great improvement in quality of life in older dogs! Often introducing hydrotherapy can lead to a reduction in the amount of medication and a reversal in exercise intolerance. Hydro-Physio also aids weight loss thus reducing the load on the joints when on land. It increases functional range of motion, nutrition and circulation in the peripheral limb. Hydro-physio is also useful in young animals who are not suitable candidates for surgery. Hydro-therapy can speed up rehabilitation, improve muscle tone and minimise loss of functional range of motion. We create a controlled environment for exercise and the buoyancy of the water reduces the load on the musculoskeletal structures. Often conditions can be degenerative and may be bilateral. 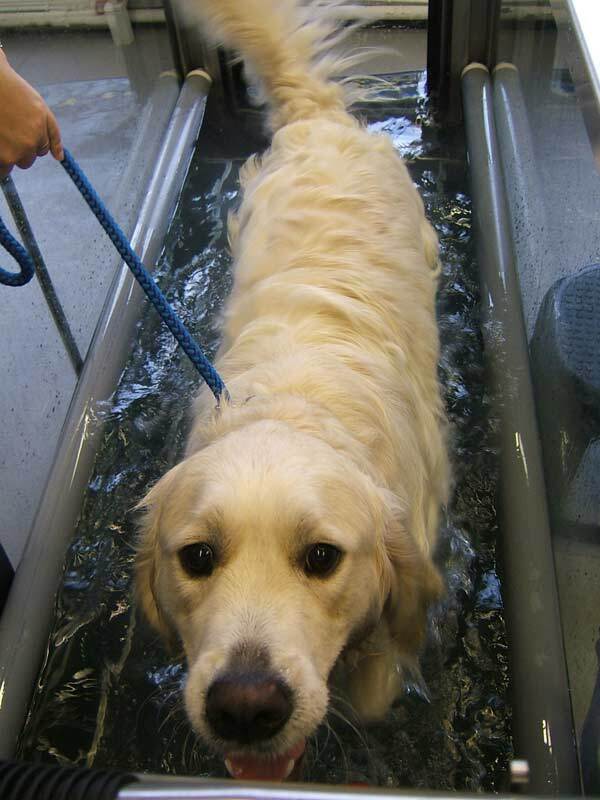 Using hydrotherapy will also strengthen the ‘good’ leg, hopefully delaying or preventing bilateral disease. Hydro-physio is extremely important for post-op recovery of spinal cases, and for degenerative conditions. Repetition leads to neurological re-education and proprioceptive ability, whilst maintaining muscle strength and endurance. At the same time circulation to the peripheral limb is improved. Voluntary fore and hind limb motion can be seen far in advance of these movements on land.